Fine Art Photography Prints by Ian Bramham: Composition in Art - Learning from Vincent. A visit to The National Gallery, London, April 2014 to see Van Gogh's Sunflowers. At the weekend I went to see a wonderful exhibition at The National Gallery in London. 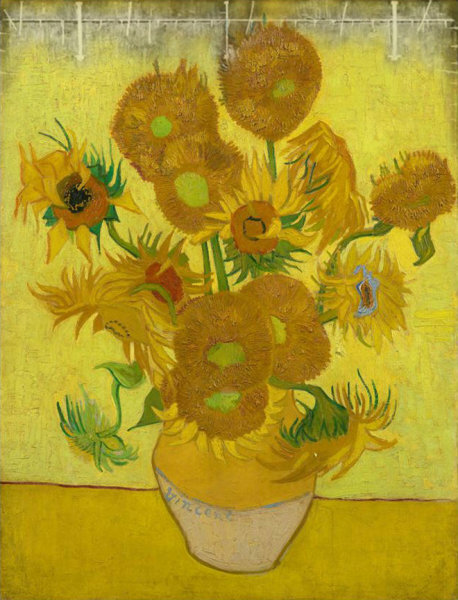 The exhibition compares two of Vincent Van Gogh's famous paintings of sunflowers. The Van Gogh Museum in Amsterdam has very kindly loaned their version so that The National Gallery can show it alongside the one that they bought in 1924 from the artist's family. Link to The National Gallery website. In 1888 Vincent Van Gogh moved to the south of France and produced some of his most memorable work in the warmth, vibrant light and intense colours of Provence. 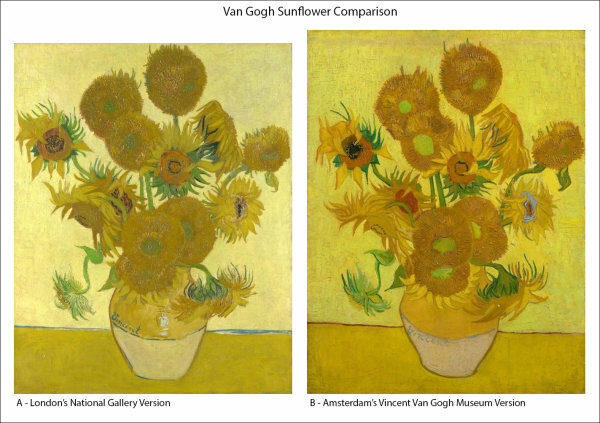 Initially it was a really happy time for Vincent and, anticipating the arrival of his friend, the artist Paul Gaugin, he produced a series of paintings of sunflowers choosing the best ones to decorate Gaugin's room - one of these is the National Gallery version that you can see on the left side of the comparison photo at the top of this article. Gaugin arrived in Arles in October 1888 but within 3 months the two artists had fallen out with Vincent suffering from a severe mental health breakdown including the well known incident where he cut off his own ear with a razor. In the months following his breakdown Vincent painted several copies of The National Gallery version and it is one of these copies that the Van Gogh Museum in Amsterdam has sent to London for the exhibition. The two paintings are hung side by side in the exhibition space and it is fascinating to stand in front of them looking at the differences. Although the Amsterdam version is a copy of the London painting it is clear that it was not intended as a replica but rather as something that would build on the strengths of the original but also improve it in certain key areas. The biggest and most obvious of these changes is that Vincent added a 3cm extra strip of wood at the top of the frame to give the flower more space between it and the canvas edge. When you compare the two versions you can see how tight to the frame edge the London version looks when compared to the later Amsterdam version - not just at the top where Vincent has added the extra strip but also on the left side where he has adjusted the composition. Vincent bought his canvases in standard sizes and for the sunflower series he used the French "Portrait No 30" dimension. It looks like he must have changed his mind about the detail of the composition quite late on during the painting of the Amsterdam copy because x-ray analysis has shown how he simply bolted an extra 3cm strip of wood across the top of the frame. The X-Ray clearly shows the bolts and nails that are securing the extra strip of wood to the top edge of the original canvas. The beneficial effect of the extra space at the top of the Amsterdam copy is even more evident when you are standing in the actual National Gallery exhibition space - the artificial lighting in the exhibition coming from the high ceiling casts a strong shadow from the picture frame right across the top of the sunflower in the London version but not on the Amsterdam copy. It's really great that The National Gallery has shown the X-Rays of the two paintings as part of the exhibition. The main reason for the X-Rays was of course to give curators and art critics a better understanding of Van Gogh's painting technique but for me, as I stood there in front of the two paintings, I felt an instant connection with the artist as I imagined Vincent wondering how to correct the problem he had found in his own composition - how far advanced was he with painting the copy before he came to the conclusion that the top flower was too close for comfort to the frame edge? I can imagine him cursing as he went out to look for a strip of wood of the right size and the tools to fit it to the canvas. Sometimes an exhibition has that extra spark of genius that makes you think much deeper about the artist and his work - this exhibition at The National Gallery in London has done just that. What makes it even more impressive is that they have managed to do it using two of the most famous paintings from one of the world's most famous artists. Make sure you see the exhibition before it finishes on the 27th April 2014 - you won't regret it!